Now here's an interesting Business Opportunity coming to the Shark Tank. 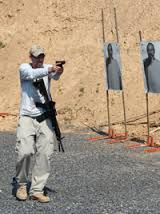 Jason Hanson, a Former CIA Agent, started the Concealed Carry Academy that trains you in a variety of Self Defense methods. Jason worked for the CIA for over 5 years and has written several articles covering topics in personal and home defense training. He is also an accomplished writer The Covert Guide to Concealed Carry: Confessions of a Former CIA Officer . Hanson's credentials certainly check out to start a Spy Escape and Evasion Course, but the websites navigation has me a little confused, to say the least. For instance, when you go to the home page it redirects you to a mailing list page if you want to proceed. Other pages read more like very long sales letters with something to sell you at the end. Son of a gun if I didn't just try to go to the specific domain, just to find out there are pop-ups also on the site. Most of these online sales tactics seem to be a little out dated in this day and age, but apparently, they still must work. Once I got over everything mentioned above, it turns out this may be a fascinating Business Opportunity giving Concealed Weapons Permit Training Course's Online. It turns out the state of Virginia has a reciprocity concealed weapons permit with 28 other states. This simply means if you get your permit in Virginia, you're also legal to carry a concealed weapon in all of these states. By taking a 90 minute online course, you can carry a concealed weapon in Alaska, Arizona, Arkansas, Florida, Idaho, Indiana, Kentucky, Louisiana, Michigan, Mississippi, Montana, Nebraska, New Mexico, North Carolina, North Dakota, Ohio, Oklahoma, Pennsylvania, South Carolina, South Dakota, Tennessee, Texas, Utah, West Virginia, Wyoming and Virginia. Jason also runs a Spy Escape and Evasion training course that is most likely what he'll be pitching on the Shark Tank Show. Unfortunately after reading a very, very long sales pitch on the "About the Course" page, there's finally a button at the bottom to get started. Maybe Hansen is just updating the page at the time I'm writing this, but right now it goes to a blank page. I have to admit, I'm a little confused exactly what Jason Hanson will be asking the Sharks to invest on the Show. Will it mainly be to invest in his Concealed Weapons Permit Course that cost's $97.00 to take online? Or is it for the Spy, Escape and Evasion hands-on training course that doesn't have anything scheduled at this time as far as I can tell. I like the idea of going to a hands-on type training course and learning some new moves, but it looks like I might have to wait until this new episode of the Shark Tank airs to find out how much it costs. As far as making it easy to get a concealed weapons permit online that's legal in 29 states, I would imagine the Sharks might be a little hesitant investing within this market. Not because they are against carrying a concealed weapon, (I would imagine a few of them already do) but because of the liability that is potentially there. Now the good news is, as easy as it appears to get a concealed weapons permit online, it's not quite that easy before you're 100% legal to carry a weapon. When you sign up for the Concealed Carry Academy Online for $97, it takes about an hour and a half to watch a video and take a test with 20 questions. All the answers are within the video, and you only need 15 correct answers to pass the test. Once you have successfully passed this online training course, Concealed Carry Academy will PDF you your certificate for the State of Virginia. You will then need to request an application packet from the State Police in Virginia, (for out-of-state permits) along with a $100 fee. The state of Virginia "does not" require you to show any experience handling or firing a pistol to receive a permit. Dam, that's a scary thought. You also need to go down to your local police station with a finger print card that's enclosed in the packet. After you send back the completed packet, Virginia will issue you a concealed weapons permit within 45 days and 100% legal in 29 states. This will no doubt be a very interesting business proposal, and one set of negotiations I'm looking forward to watching on ABC next Friday night. Why would he pick Cedar City? It is one such a hard location to travel to. One of the sharks says travel costs make the overall cost way too high and he is correct. I have lived in southern Utah and you are 3 hours or more from a major airport and there is no transportation to Cedar City from the major airports, so you have to rent a car(which will just sit in a lot while you take the course). Why not do this spy camp closer to a population center? I think it's a combination of factors, including the Front Sight concept out of Primm. Of course, Front Sight's only an hour from McCarran Airport, whereas Cedar City is 3 hours from either SLC or LAS, so it's not the same thing. When I saw the episode I was glad to see the investors or at least some of them saw the potential in Jason's idea. With one in four women and one in seven men involve in domestic violence in America the need is out there. Unfortunately you don't usually know that the person your with is capable of killing you until you do. So even if you never imagined yourself as someone who would need this sort of training, I for one was glad to see that it's out there even if it is in Utah. You go Jason, good job and stay home with your family! Besides that driving course sounds like one of the best parts .